This paper endogenises a start-up’s choice between competitive and cooperative commercialisation in a dynamic environment. 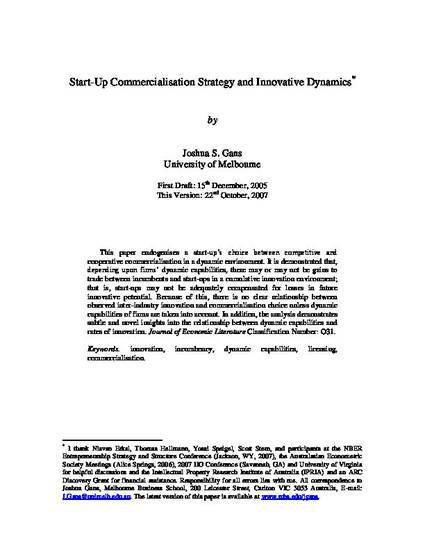 It is demonstrated that, depending upon firms’ dynamic capabilities, there may or may not be gains to trade between incumbents and start-ups in a cumulative innovation environment; that is, start-ups may not be adequately compensated for losses in future innovative potential. Because of this, there is no clear relationship between observed inter-industry innovation and commercialisation choice unless dynamic capabilities of firms are taken into account. In addition, the analysis demonstrates subtle and novel insights into the relationship between dynamic capabilities and rates of innovation.